Dead Space 2 Art Director Ian Milham says there's been "a lot of discussion" about making a live-action movie based on the game but EA won't jump into anything unless its sure the job will be done right. There are two animated films based on the Dead Space franchise, Downfall and Aftermath, but talk about a live-action flick has thus far remained entirely in the domain of fanboys and forums. The property has obvious cinematic potential as a claustrophobic, Alien-esque horror-fest. So what's the holdup? "We would love to have a live action film and we've had a lot of discussion. But one of the reasons Dead Space still exists and is popular is because we've made sure to do everything right," Milham told the BBC. "So we're doing the same with the film, not just a cheap cash-in but to do something really worthwhile, so we'll see." Milham also said that the still-emerging medium of videogames offers greater possibilities than film. "Movies are fine, but in games we're still showing people things," he added. "We're still pursuing opportunities that have never been done before." PR spin or not, it's a very smart approach to take. Game-based movies have a reputation for being bad news and no franchise is helped by a high-profile film project that turns out to be garbage. 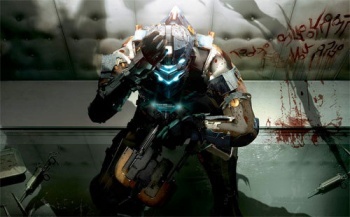 A Dead Space movie could be awesome if it's done right, but if it can't be done right I hope EA really does have the wisdom not to do it at all.